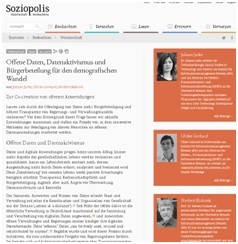 An interesting article in German written by our partners from ifib was featured on Soziopolis with the title “Offene Daten, Datenaktivismus und Bürgerbeteilung für den demografischen Wandel”. It presented the innovative methods that Mobile Age project is using for the participation of elder citizens in the development of open data applications. You can read the full article in Soziopolis.